This winter, so far at least, has been one of the wettest here in Southern California in several years. That is great and I love it. The downside is that the drainage in our city of Hemet is less than optimal. It is excellent here in our Four Seasons community, but once we exit the gates it is a mess when it is raining. When it’s raining you have to cross a virtual river to get from the parking lot to our primary grocery store. I soaked my tennis shoes one rainy day. The office that Terry works out of to do her permit running work has similar issues. Terry found rain boots at Tractor supply. 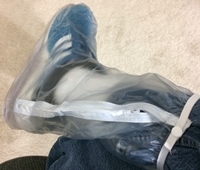 I looked there, but all they had was oversized yellow hip-high rain boots and overshoes, the largest of which did not fit over my tennis shoes. So what did I do? I did what I always do when in doubt. I went to Amazon. And I found a solution that works. I’m keeping these in the car. No more soggy tennis shoes.